Khyber pakhtunkhwa Public Service Commission is an administrative body which has the mandate to conduct competitive exams for the posts of grade 17 and above in the province of KPK. Almost every year, there is requirement to fill the vacant seats of institutes, departments and ministries of provincial govt. of KPK. For this purpose, KPPSC invite applications from interested bachelor degree holder candidates with domicile of KPK province. After advertisement in newspapers and its website, KPPSC starts the competitive exams at a regular time. Written test, interviews and psychological tests are held during the competitive exams. Written tests are held initially. After few months of the written test, the results of these written tests are announced by KPPSC at its official site for the students. The successful candidates of written test are given call letters for interviews and later for the psychological test. The results of interviews and psychological tests are also issued at the official site of the commission. It is compulsory for the candidates to pass all these tests in order to qualify for their desired post. Very few candidates are able to qualify for the post of KPPSC which means that the commission selects the best person for the post from the whole province of KPK. After the result announcement of competitive exams for a particular post, the successful candidates are given compulsory training and they are properly inducted to the post. Female Charge Nurse (Disable Quota) (B-16) In Health Department. (Advt: No. 07/2018, S.No.24). Female Charge Nurse (General Quota) (B-16) In Health Department. (Advt: No. 07/2018, S.No.22). Planning Officer (B-17) In Elementary & Secondary Education Department. (Advt: No. 06/2016, S.No.06). 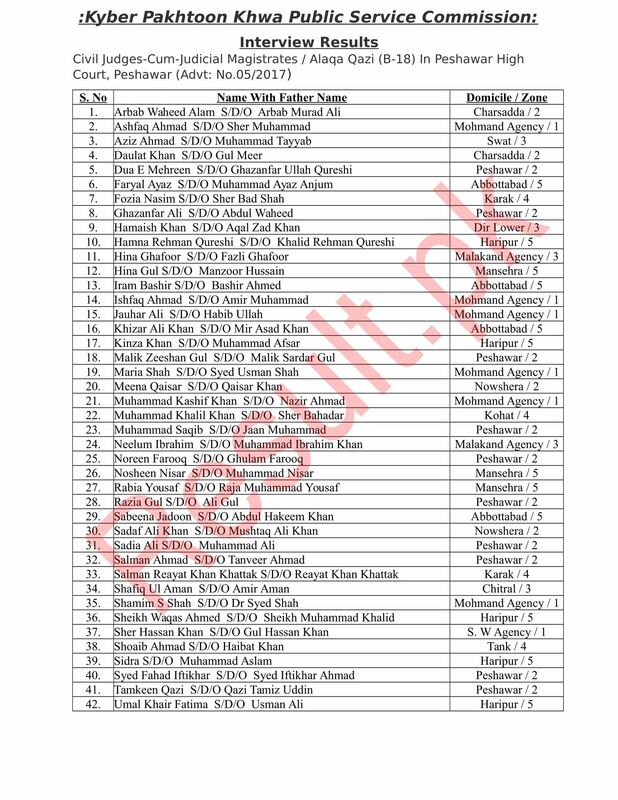 Selected students obtained marks in ss pashto in zone 1 ,ESED ,Adv,no ,3/2028. Also tell please my interview date. sir please tell me when your march 2018 advertisment test will be accour .